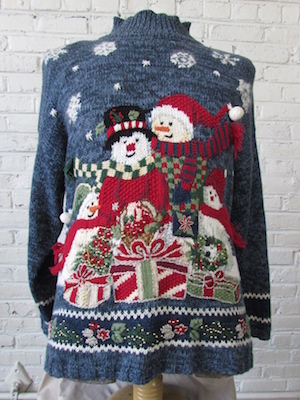 (Mens L) Ugly Xmas Sweater! Snowman Family w/ a Pile of Xmas Presents! Embellished w/ Beads! Home > Ugly Christmas Sweaters > Ugly Christmas Sweaters (pullovers) > (Mens L) Ugly Xmas Sweater! Snowman Family w/ a Pile of Xmas Presents! Embellished w/ Beads! Ugly Christmas sweater pullover! Heathered blue base with a family of snowfolk bundled up in scarves and sweaters huddled around a big pile of Xmas presents! Behind the family there are big soft white snowflakes. The cuffs and the bottom of the sweater have a band of darker blue knit trimmed with white and embellished with flowers and leaves. Portions of the sweater are embellished with little gold colored beads. Has shoulder pads, easily removable. Tagged by Heirloom Collection. Ramie/Cotton blend. Condition: Very Good. Has a light yellow pinky sized stain on the face of one of the snowmen and a little red staining near the bottom of the snowmen from color bleed. Does not detract from the awesomeness of this sweater!